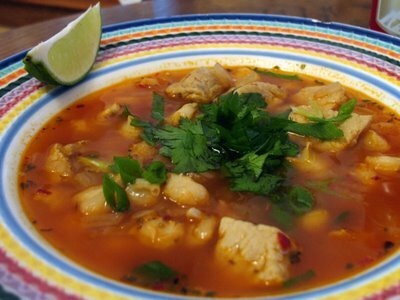 Yes, yet another pozole recipe… I swear, we should just rename the site to “We [heart] Pozole”. This one, unlike the others we’ve made, is closer to “traditional” pozole in that it doesn’t have a thick, tomato base, but rather a clear, flavorful broth. The red color comes from guajillo peppers that have been pureed and stirred in; they added a nice subtle pepper flavor without a lot of spice. 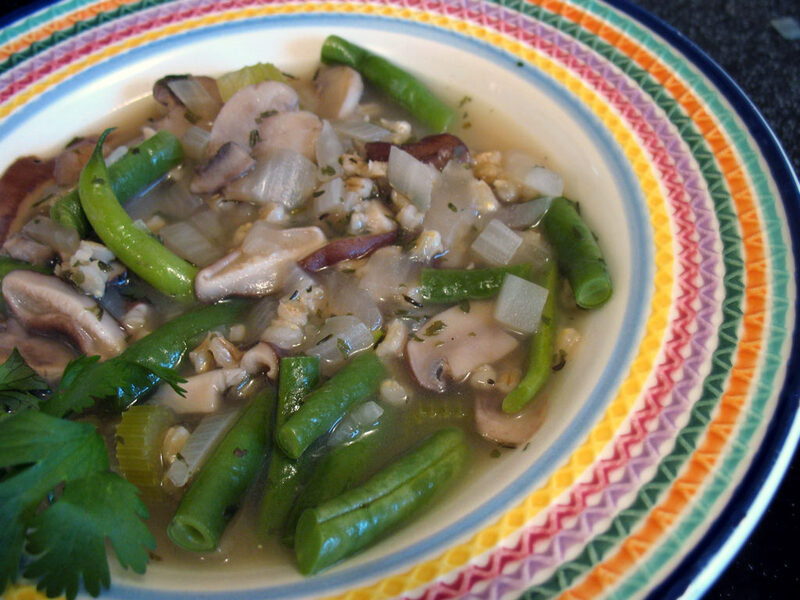 This recipe is from Healthy Latin Cooking. Soak the peppers in hot water for 20 to 30 minutes until soften, then transfer to a blender with 1/4 cup of the soaking water and puree until smooth. Heat the oil in a large saucepan over medium-high heat. Add the pork and cook for 3 minutes. Add the onion and cook for another 2 minutes. Add the garlic, cumin, oregano, and bay leaf and cook an additional minute or two, until the pork and vegetables begin to brown. Add the water and hominy and bring to a boil. Lower the heat to medium-low and simmer for 30 minutes. Add salt and pepper to taste, and remove the bay leaf. Stir in the pureed peppers and simmer for 5 more minutes. Taste and season again with salt and pepper. Top with chopped green onions and cilantro. First recipe from our new Jay Solomon cookbook (thanks Cathy! ), Vegetarian Soup Cuisine. Three types of mushrooms in this one – can’t go wrong there. End result was a little bland, though, so we replaced a cup of the water-based broth with chicken stock. Next time around we’ll probably replace all 6 cups of water with a chicken or vegetable stock and throw in some crushed garlic for added flavor. Heat oil in a large saucepan. Add the mushrooms, onion, celery, and shallots and cook for 8-10 minutes over medium heat, stirring frequently. Add the water, barley, wine, mustard and seasonings, and cook for about 50 minutes over low heat, stirring occasionally. Stir in the green beans and cook for 10 minutes more. Let the soup stand for several minutes before serving. We were rushed for time tonight, so this recipe from Cooking Light’s SuperFast Suppers cookbook sounded perfect — it was on the table 20 minutes after cracking open the fridge. The sauce thickens nicely and certainly doesn’t taste “light”. Combine soy sauce and next three ingredients in a small bowl; stir well with a whisk. Place non-stick skillet coated with cooking spray over medium-high heat until hot. add beef. Stir-fry for 4 minutes or until browned. Remove beef from pan; set aside and keep warm. Coat pan with oil. Add garlic and bell pepper; stir-fry 2 minutes. Add snow peas and water chestnuts; stir-fry 1 minute. Return beef, juices, and soy sauce mixture to pan and cook 30 seconds, or until slightly thickened. Serve over noodles. 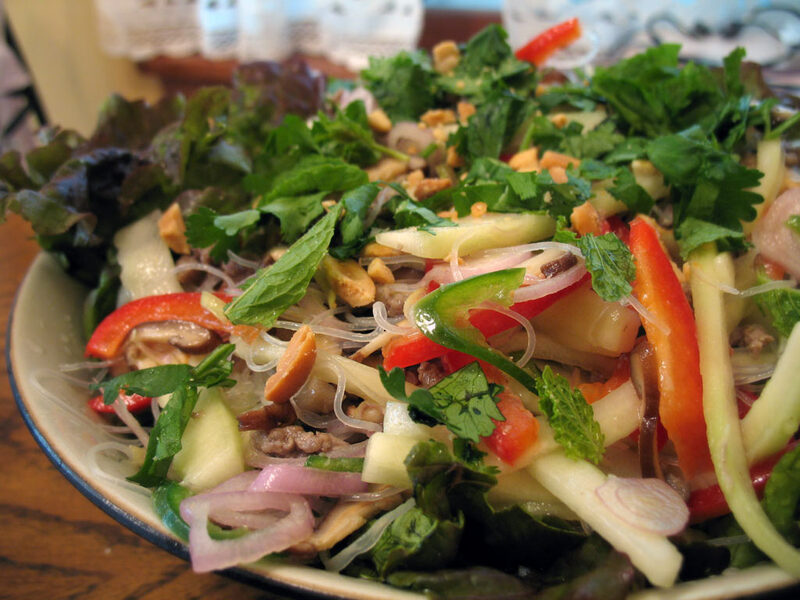 This is a nice summery salad featuring lots of crisp vegetables, ground pork, and cellophane noodles (also called glass noodles or bean thread noodles). It’s also the first recipe we’ve tried from the new cookbook that Lisa’s mom gave us over the weekend. All of the recipes in the book look delicious; I’m sure we’ll be featuring more in upcoming weeks! Soak the mushrooms in warm water to cover for 30 minutes. Drain, remove and discard the stems and cut the caps into fine julienne. Using only the pale bottom part of the lemongrass stalk, peel away the tough outer layer, smash the stalk with the side of a chefs knife and thinly slice on the diagonal. Seed the chili, then thinly slice into rings. Set the vegetables aside. Season the pork with the salt and white pepper. In a saute pan over high heat, saute the pork until it turns opaque and is cooked through, 3 to 4 minutes. Transfer the pork to a sieve and let drain, then place in a large bowl. Drain the noodles and add to the bowl with the pork. In a small saucepan over medium heat, combine the lime juice, fish sauce, sugar and water. Heat until the sugar has dissolved, pour the mixture into a bowl and gradually whisk in the canola oil. 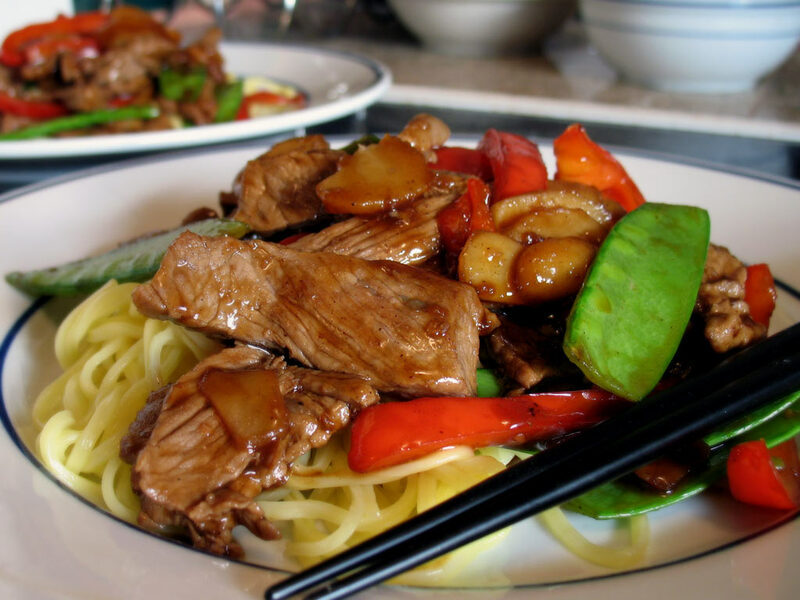 Add the cucumber, bell pepper, shallots, mushrooms, lemongrass and chili to the pork and noodles and toss to mix. Add the lime-juice mixture and toss to coat evenly. Line a platter with the lettuce leaves. Top with the pork and noodles, garnish with the peanuts, mint and cilantro and serve. Serves 4. 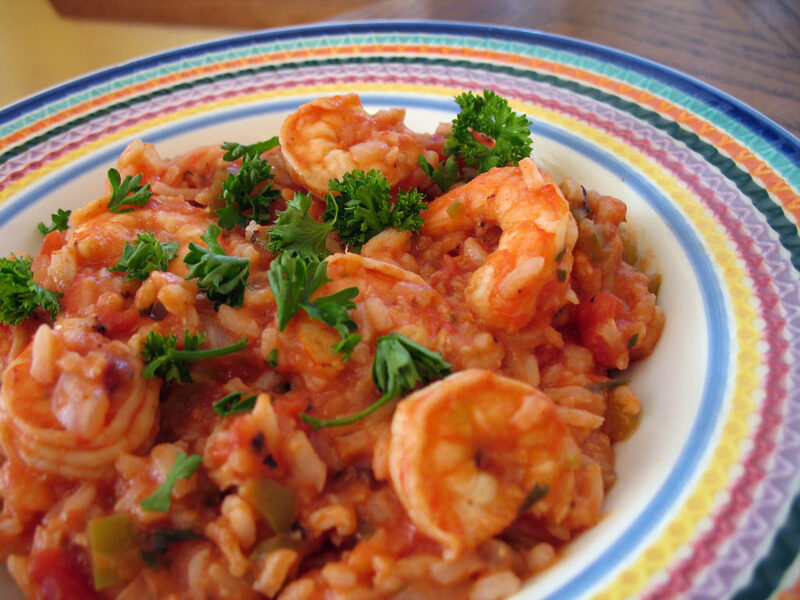 We returned to our old friend Great Bowls of Fire for this spicy shrimp and rice dish. This is another one of the “huge portion” recipes that we love. Made it hotter by adding hot sauce just before serving. Cook rice with 2 1/2 cups water until all liquid is absorbed. Fluff and set aside. Meanwhile, heat the oil in a large saucepan. Add the onion, bell pepper, celery, garlic, and chili pepper and cook for five minutes over medium heat. Stir in the shrimp and cook an additional 4 minutes. Add the crushed tomatoes, 1/2 cup water, and the remaining ingredients and bring to a simmer. Cook 15-20 minutes over medium-low heat, stirring occasionally. Remove from heat and stir in the rice. Let sit for 5 minutes, then serve.